It was a tight game in Sacramento, but ultimately the result that we expected came about, as Eastern Washington was able to claw their way to a 65-60 win over Sacramento State. Eastern Washington won the same way they have won a lot of games this year - riding Cliff Colimon and Collin Chiverton. Colimon scored 17 points, including 11 in the final 5 minutes. In total, he scored 11 of their last 15 points, and it seemed like he was not going to allow them to lose. Chiverton was huge himself. Coming off the bench again because of a bad foot, he poured in 21 points in 25 minutes, including knocking down 6 treys. 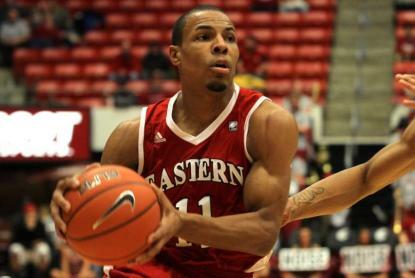 He is the wildcard for EWU... when he is on, he is good enough that they can beat anyone, Weber State included. For Brian Katz and Sacramento State, the hole to dig out of it getting larger and larger. They simply couldn't make enough plays down the stretch, and they fall to 0-4 in the Big Sky. They shot 40%, but they were just 4-19 from beyond the arc and missed 9 free throws. In a 5 point game, those are the things that can't happen. Eastern Washington now travels to Northern Colorado on Saturday, which should be an entertaining game. Sacramento State hosts Idaho State in a must-win game for them. If they lose to the Bengals at home, they will be 0-5 and 2 games behind everyone except Northern Arizona. The way they have looked so far, I am not sure that is a hole they would be able to overcome.